"Jalapenos are stuffed with cream cheese, wrapped with bacon, baked, and then finished on the grill." Spread cream cheese into jalapeno pepper halves; wrap each with a piece of bacon. Secure the bacon with toothpicks to prevent unraveling while baking. Arrange wrapped jalapeno peppers onto a baking sheet with cream cheese side facing down. Bake in preheated oven for 10 minutes, turn, and continue cooking until the bacon is completely browned, about 10 minutes more. Transfer jalapeno wraps to preheated grill; cook until the bacon is crisp, 2 to 3 minutes per side. 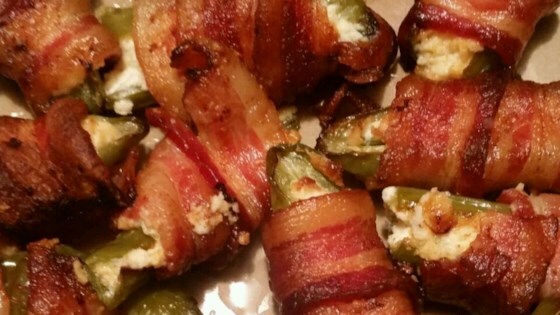 Jalapenos are stuffed with cream cheese, wrapped in bacon, and grilled! Our family makes this quite often (but we just go straight to the grill, no oven). We've also stuffed the peppers with ground sausage instead of cream cheese then wrap with bacon. I add 1/2 cup shredded cheddar cheese in with the cream cheese before I stuff them! Makes a few more jalapenos (16-18) Family love these! Delicious, they are a lot less messy if you mix the cream cheese with 3/4 cup of cheddar. I also use a teaspoon of cajun seasoning to the cream cheese mixture before wrapping with bacon.